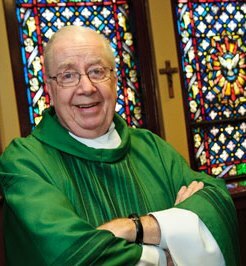 In his more than 50 years of religious life, Fr. 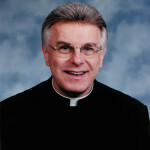 Charles Bolser, CSV, has spent most of his career in high schools, first as a teacher at Griffin High School in Springfield before joining the administration at Bishop Gorman High School in Las Vegas, at Saint Viator High School in Arlington Heights and at Cristo Rey St. Martin College Prep in Waukegan. He also has spent years in pastoral work, serving as pastor of Maternity of the Blessed Virgin Mary Parish in Boubonnais, before his last assignment as pastor of St. Viator Parish in Chicago. Yet, even in retirement, he continues to stay busy. He leads two Bible study groups, one for men and another for women, but he also shares his insights into the gospels during regular liturgies. Fr. 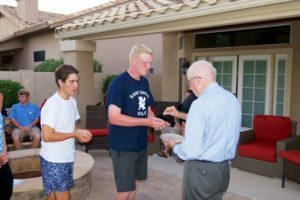 Charlie regularly helps out with celebrating Mass at Holy Family Catholic Community in Inverness, as well as with the Benedictine Sisters of Chicago and for the developmentally disabled adults of St. Coletta’s Foundation of Illinois. His latest endeavor is writing a blog. Fr. Charlie started posting his entries in mid-March and he is enjoying the process. Most of the posts examine Scripture passages, but others tackle common themes.